Dr. Sharpe is a board-certified family medicine physician whose patients are from 15 years to geriatrics. A graduate of Lehman College, she received her bachelor of arts degree in chemistry. She was awarded her medical degree from State University of New York School of Medicine at Stony Brook and completed her family medicine residency training at Montefiore Medical Center. She then went on to complete a fellowship through Montefiore’s Adult Developmental Disabilities Fellowship Program. She is affiliated with White Plains Hospital. She is a member of the American Academy of Family Physicians. 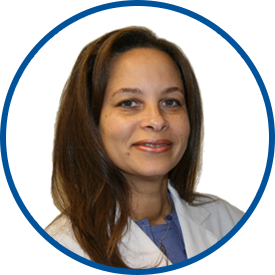 Dr. Sharpe was in private practice in Dobbs Ferry since 1996 before joining Westmed Medical Group in December 2010. *Dr. Sharpe is fantastic in all ways!!! Professional, caring, sensitive & intelligent. Very approachable. Dr. Sharpe is a very good MD she's been my doctor since 2012 and i would highly recommend her to other people. Dr. Sharpe is an excellent and compassionate physician. She really listens and gives clear, actionable recommendations. I trust her advice. I have an excellent care under Dr. Sharpe. Over the years, our family are under her care even before she joined WESTMED. She is the only doctor I have that answers email the same day. Our family are happy and lucky of her commitment, caring, and competency, She is the best internist we ever had. Dr. Sharpe is an unusually caring and effective health care provider. I am happy I found her. Dr Sharpe is a very caring and genuine doctor. She is decided to her profession and it shows with the care she gives her patients. *Dr. Sharpe is the absolute best! Dr sharpe by far is a wonderful doctor. Dr. Sharpe is an excellent physician and the most approachable physician I know. She is always thorough, and caring. I recommend her to all of my friends. Dr Sharpe is the best! dr Sharpe is one of the most caring, thorough and knowledgeable physicians I have ever had. I expect to wait a little longer because she takes such care for her patients. I have recommended a numerous people to her. Dr Sharpe is the best. She us holisitc in her approach. She truly cares. Dr Sharpe shows genuine care and treats you with respect. She never rushes and always spends a great amount of time with me to explain my medical care and medications. I always leave feeling confident in my medical needs and medication. she always follows up with new medications and she responds to emails with any concerns I may have about my medications. I would definitely recommend Dr. Sharpe to my family and friends. Dr. Sharpe is an excellent doctor. My wife and I have been seeing her for over 8 years and have followed her from her practice to Westmed. She is an excellent and caring doctor and really spends time listening to the patient's concerns!